I really enjoyed Cicero’s writing and insight into politics and government, but too much of Cicero’s Republic is missing to make it a compelling read. What parts do exist are reminiscent of Plato’s Republic, Aristotle’s Politics, and Polybius’s Histories and Cicero certainly built upon those sources. It is interesting to read what this great man who fought against Cataline, Julius Caesar, Mark Antony, and Octavian/Octavius/Augustus has to say on the topic. I certainly recommend Cicero’s Republic to anybody interested in Roman history or the history of political thought. 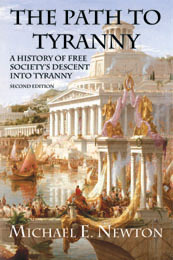 However, to the more casual reader or those more generally interested in political thought, there is little benefit to reading this book if you already read or plan to read Plato, Aristotle, and Polybius. If we had all of Cicero’s Republic, I’d likely be giving it four or five stars, but it deserves only two or three stars as it exists to us today. Turning to the second half of the book, The Laws, which appears to be more complete and thus easier to read and review, Cicero argues that laws come from nature, not men. Cicero explains, “Law was not thought up by the intelligence of human beings, not is it some kind of resolution passed by communities, but rather an eternal force which rules the world by the wisdom of its commands and prohibitions… That original and final law is the intelligence of God, who ordains or forbids everything by reason.” In this respect, I found sections of Cicero’s The Laws to be quite similar to Frederic Bastiat’s The Law. Cicero then describes Rome’s legal code and proposes some changes. This section is sometimes interesting from a historical perspective, but less so in terms of political philosophy. However, it becomes extremely tedious and dull at times when Cicero describes certain aspects of Rome’s laws in depth. All in all, very insightful, though a bit tedious at times. But the worst aspect is the incongruous nature of the work because of all the missing text. I also wish the notes were put on the bottom of each page rather than in the back. I for one enjoy reading every note and found it difficult to flip back and forth four or five times per page. 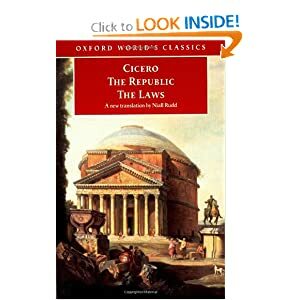 In total, I am giving Cicero’s The Republic and The Laws just three stars (out of five). I am sure this would disappoint Cicero greatly, but I place little blame on him. If his writing existed in full, I’m sure he would easily earn four stars and possibly five, though Cicero himself admitted in The Laws that he could not compete with Plato’s writings on the same subject, which is why it would likely earn just four starts while Plato’s Republic and Aristotle’s Politics deserve five stars. It may be hard to pin down exactly what the Occupy Wall Street protesters want, but one of the sources of their frustration seems clear. Many of the demonstrators are drowning in student debt. One proposed list of demands for the Occupy Wall Street movement includes “free college tuition” and “immediate across the board forgiveness” of student debt. While neither demand may be very realistic, the student debt problem is very real. Of course, if some of the protesters get their way, with free tuition and debt forgiveness, the problem might go away. Rose Swidden, the agriculture student-turned-protester, acknowledges the demands may be far-fetched, but said it is worth a try. Daniel Shays was one such army veteran disappointed by how the government treated veterans. Shays, who returned to farming after the war, was also angered by how creditors treated farmers who had borrowed money. As delegates from five states met in Annapolis in 1786 to try to fix some of the defects of the Articles of Confederation, Daniel Shays led a rebellion of 1,200 men against the Massachusetts government. The rebels were pardoned and they succeeded in elections the following year. The new legislature passed the debt relief that the rebels demanded. Shays’ Rebellion was all about debt relief, which is a major demand of the Occupy Wall Street protests. We surely should heed the words of General Henry Knox and Alexander Hamilton and swear off this idea of debt forgiveness. Debt forgiveness is nothing more than stealing from a large number of people to satisfy the demand of a small but vocal minority. 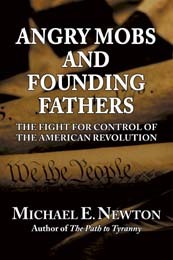 Writing for What Would The Founders Think? In this post, Michael Newton tries to restore precision to our language. The American experiment was conceived as a republic, not a democracy. Present day efforts to conflate the terms not withstanding, the Founders were wary of democracies and they had good reason. We don’t want democracy in Egypt! We want republicanism. CTV: Will U.S. help Egypt transition to democracy? I for one shall hope that Egypt forms a republican and moderate government, just as Alexander Hamilton recommended for our own country more than 220 years ago.